The real estate boom has ended, allowing more time to consider what’s best for us all in the still-unbuilt spaces of the port area and in the region centered on Barra da Tijuca. Those who left poverty in the last decade will not quietly slide back into it. They’ve now had a taste of being considered (and considering themselves as) full citizens of the metropolitan area. Pressure will come from them, in some form. Everyone’s expectations have risen, as governments have begun to transform the metropolis. And these aren’t likely to slide back, either. The Olympics will still happen, bringing healthy global attention and tourism revenue. Carnival sponsorship is down from last year and it’s begun to rain. Perhaps the revelry will be less damaging to the city than otherwise. Shortages, unemployment, inflation– these could all put pressure on politicians to be more responsive to voters. Certainly there’ll be fewer funds with which to grease palms. The justice system is sending a strong message about corruption to all of society, which could orient politicians and government officials more towards the common good and away from interest-group and personal aims. The public spotlight is at last on Cedae, the state water and sanitation company that has eluded regulatory activity for the last seven years, incurs severe water losses and faces enormous sanitation challenges. Petroleum output has dropped, and Brazil could start investing in alternative energy sources (besides hydro, until now so dependable). The bad news harks back to global warming, to which too few of us have paid attention. Not only is Rio suffering with the water and power issues of the entire Southeastern part of the country, but the West Zone building boom, spurred by the Olympic Games choice of main venue, has gone on with no regard for the fact that it’s set in a flood plain. Not to mention rising sea levels and the polluted Guanabara Bay and West Zone lagoons (which worsens, with the drought). Spotty water and power supply could lead to social unrest this or next year. Then there are falling oil prices (and those of other commodities that were fueling the Brazilian economy). And the Petrobras meltdown, due to this lone external factor and to local mismanagement and corruption. The oil and gas sector, centered on Rio state, is at a standstill and it’s hard to say when it might gear up again. Layoffs are on and will ripple through the local economy. Oil and gas tax revenues have dropped, leading to cuts in the state budget. Just as Rio’s state-run police forces embark on a heartening program to improve pacification and bring violence back down, newly-sworn-in Rio Governor Pezão has vowed to maintain public safety, education and health spending. These priorities are particularly important, given revenue reductions in neighboring cities highly dependent on petroleum royalties, and a construction halt at Petrobras’ Comperj petrochemical complex, in Itaboraí. The petroleum and power difficulties, with resulting price increases, have led to national projections of 7% inflation for this year. Another reason for social unrest. Crime is on the rise, with more street robberies (homicides are down) and stray bullets. Hundreds of cops are posted to South Zone beaches on weekends, to keep the peace. A new team is making and implementing policy at the state Public Safety Secretariat. It’s to be hoped they can count on needed funding and on the police corps’ capacity for change. Community participation was scanty during the years of Rio’s 2009-2013 turnaround, with most policies coming from the top down. 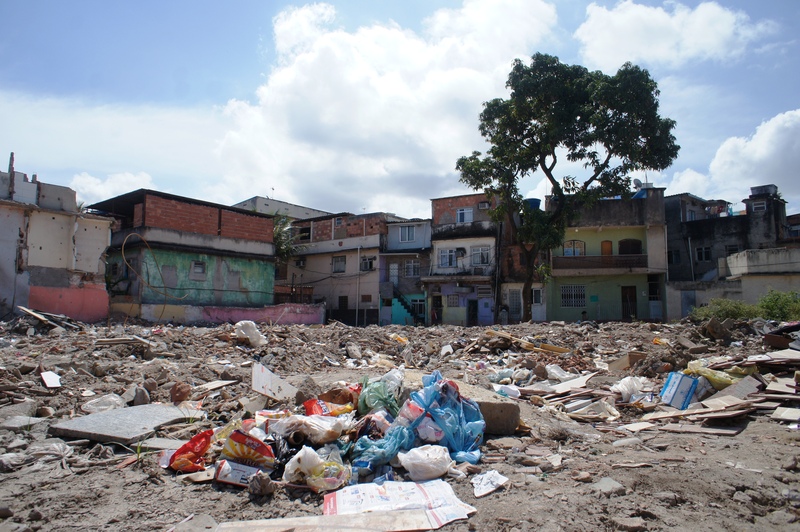 If Morar Carioca, the city program meant to upgrade all favelas by 2020 (part of the Olympic legacy), had fully happened, the urban social dynamic might have been healthier and better for all. But the program never got off the ground — and recent events here could almost lead one to conclude that the reason for this (never officially given, since officially, the program does exist, in much-reduced form) is that, with local residents, urbanists and architects galore in the picture, Morar Carioca was too complex for construction companies to pad their bills and pay off officials, as they allegedly did in the “Lava-Jato” Petrobras corruption scandal. And then there are city politics. Mayor Eduardo Paes is still focused on getting Rio ready for the Olympics, but after the Games, in October 2016, he also has a mayoral election to think about. Paes can’t run again (he’s reportedly aiming for governor in 2018 and president after that), but has a candidate lined up, Pedro Paulo Carvalho, his longtime right-hand man, recently elected to Congress (but on leave to serve the mayor as executive secretary). The succession could involve leaving his PMDB party, which may favor another candidate. Meanwhile, the same clans run politics on the state level, in the legislature. And some observers say Governor Luiz Fernando “Pezão” Souza’s name is on the list of bribed “Lava-Jato” politicians (along with that of his predecessor, Sérgio Cabral), soon to be made public. If he leaves office, that would put the vice-governor, 80-year-old Francisco Dornelles, in his chair. In the face of the troubles listed above, and so many more, the seemingly easy municipal-state-federal alignment that kicked off Rio’s rise from the ashes in 2006 is undone and, you might say, so is Brasília itself. One shouldn’t expect much from those quarters — President Dilma Rousseff has reminded governors that the water shortage is a state problem (although you could say it’s global, no?) and she’ll do what she can to help. We have yet to see if, despite budget cuts, federal help also means supplying Rio with already committed PAC funds for projects such as sanitation and a cable car, connected to a metro stop, in Rocinha favela. To top things off, longtime conservative Rio politician, congressman Eduardo Cunha (never convicted, but the object of corruption indictments reaching back to 1999), elected yesterday president of the House, is expected to do what he can to obstruct President Dilma’s wishes, and might even help along her impeachment, if such an opportunity should arise. In 2006, when the state oil company made an allegedly overpriced U.S. refinery purchase, she was Petrobras board president. The petroleum curse does seem inescapable. Thus, for Rio de Janeiro, the silver lining of the current crisis certainly lies in having been stopped, for both global and local reasons, in our very oily tracks. Now, as fewer petrorreais circulate, could turn out to be a better time than any, to pressure and plan for a metropolis focused on the welfare of most of those who live in it — instead of a select number of political and business groups. This entry was posted in Brazil, Porto Rio de Janeiro, Transformation of Rio de Janeiro / Transformação do Rio de Janeiro and tagged CEDAE, Comperj, Eduardo Cunha, Eduardo Paes, Francisco Dornelles, Luiz Fernando Pezão, Morar Carioca, Operação Lava-Jato Rio de Janeiro, Pedro Paulo Carvalho, Rio de Janeiro community participation, Rio de Janeiro crime, Rio de Janeiro crisis, Rio de Janeiro drought, Rio de Janeiro oil and gas, Rio de Janeiro Petrobras, Rio de Janeiro power shortage, Rio de Janeiro real estate, Sérgio Cabral. Bookmark the permalink. 2 Responses to Rio de Janeiro: time for a rethink?